Recently built an outside shed for the dust collector. In addition to opening up some valuable shop space, it’s a lot quieter and cleaner. The overhead sch 40 PVC duct was previously installed in the shop, and it was only necessary to turn around some tees to reverse the direction of flow. There are three 4” drops; one behind the bandsaw, one for the table saw and one for the downdraft table. There is also a 2 1/2” drop that connects to each of the five work stations in the center of the floor. A manometer was also added to monitor the pressure in the filter. The level doesn’t move much now which means that the Wynn filter is relatively clean, or the manometer isn’t working correctly. It’s a pretty fool proof system, but time will tell. I’ve had this harbor freight dust collector for about five years now and I’m still impressed how much air and dust it moves. It runs pretty quiet outside the garage, and I may have to install a red light inside the shop to let me know it is running. I don’t have an air filtration system so I will leave the dust collector running occasionally to get some air changes in the shop. At 1500 CFM it can clear the air pretty fast. I added the air vents in the doors after first use when the pressure pushed the shed 1/2 inch away from the garage wall. I didn’t want to tie it to the house except at the base, but wound up adding a few framing clips which attached to the wall studs. Great addition to your shop. That surly will give you more working space!! I’m showing this to the wife. Can you get some pics of the interior of your shop? I want to plumb my shop but the wife is adamant that drops and trunk plumbing will be hideous and in the way as we also park in the garage/shop. Nice to see you putting the dust collector out side the shop where it belongs, and it looks like you are venting to the outside, Now if you can figure out a way to eliminate the filter you will have a super system, I live 700 miles north of you and it works great even in the winter. just use it when you need it. Would love to see a few pics of the ducting/layout in the shop. Curious- if you’re venting outside, why the air filter? Or does some air flow back into the shop? Asking because I’m looking at doing the same thing – put the dust collector in a little shed on the side of my shop. Trying to decide if I’ll vent outside or return air to the shop. I have no AC or heat (Houston) so I can do either. Nice work, you will appreciate the extra shops pace and one less noisy tool in the shop. I have a red lamp in the ceiling that comes on when the unit is in use. Very helpful when calling it a night and seeing the red light to remind me to cut it off. Same bulb for 15 years I believe. That is very nicely done with a good layout. I would consider painting the OSB to prevent moisture pickup. Just as a note, your 1500 cfm for this dust collector is a bit over rated. 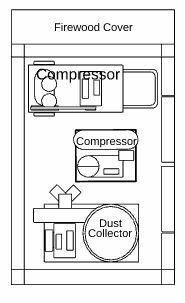 At best a HF dust collection for will get around 600 cfm. But if it is working for you, that is what counts. I have a 5 hp cyclone and can not get 1500 cfm from 4” PVC. That is a great way to handle your dust and you did a fine job on rigging it up. Exactly what I’m looking at. Dust collector and two compressors in the shed. Thanks for the comments. I may try to cram my pancake compressor in there. It is needed outside to blow the filter clean anyway. And here are some photos of the ducting. I can’t vouch that it is will not seem obtrusive to some people. Thanks for the ducting pictures. I like what you’ve done with the shed, the collector, and the ducting. Appreciate you posting this. Good ideas.